India's new mystery opener, Prithvi Shaw, who only made his first class debut 18 months or so ago, has hit a 99 ball hundred on Test debut against the West Indies. All the more mystifying as to why they didn't give him a go in the dead rubber at The Oval last month as expected. Well that's fairly rubbish to wake up to. WI have 5 second innings wickets left and still trail by over 300. Are Tests in Asia becoming Mission Impossible for non-Asian sides in the post-Warne, post-Swann era? 2) Pakistan made 205 for the first wicket v Aus but both openers are now out. 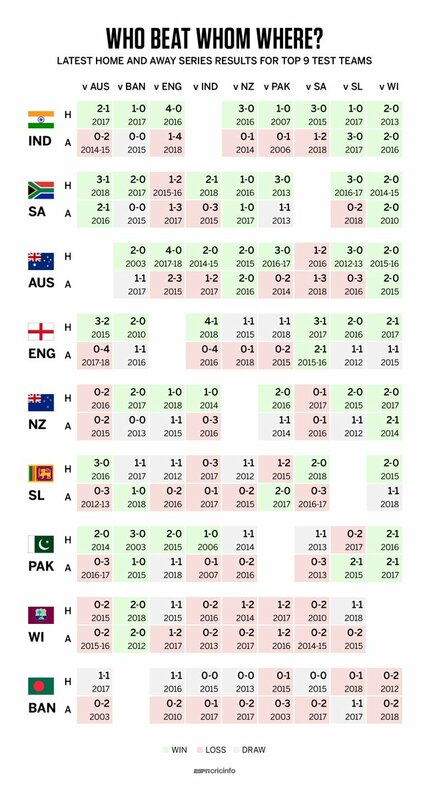 Would be interesting to count the % of Tests that non-Asian sides have won in Asia (v India, Pakistan or Sri Lanka) in the last 15 years where the side did not include Warne or Swann, but also how that % is dropping by year. Last edited by Satchmo Distel; 07-10-2018, 11:50. Essex's Peter Siddle - as he is surely known the world over - has earned a recall to the Australia Test side after two years since his last cap. Five uncapped players. Two wickets so far. As much joy as it may give me to see Australia struggle, I'm very pleased that Siddle is being rewarded for his season with Essex. He's comfortably the pick of the bowlers so far, being the most dangerous and the most economical. Last edited by Kevin S; 08-10-2018, 08:09. By my reading, that's four drawn series in 2012-14 and nothing since for non-Asian teams in Asia excluding Bangladesh. Maybe too small a sample. Will this be one of those classic Wahab Riaz spells where he bowls with fire and thunder but takes precisely zero wickets. Aus 318/5, need to survive another 24.1 overs. Khawaja is doing a mini-Atherton: 137 off 291 balls (Atherton was 185 off 492 though). Last edited by Satchmo Distel; 11-10-2018, 11:40. Khawaja gone after a brilliant knock. Last review too. Australia still have a good chance. Are people watching this match on TV? It popped up on the Sky EPG on Star Gold while I was browsing last night but it wasn't clear if it was generally available or on an extra subscription channel. Well played Australia. You still need 20 wickets to win a test match. Fair play to Australia, that is a mighty effort. WI 295/7, Chase 98* overnight. India bowled 95 overs on the first day, which is quite rare these days. Only one seamer is fit because Thakur went off after 10 balls with a groin injury. Opinion seems to be that 295/7 is nowhere near enough. Nathan Lyon takes 4 wickets in 6 balls as Pakistan go from 57-1 to 57-5. Reasonable recovery since to be fair to 150-5. And a good recovery in the end to 282 all out. Few blows from Starc gets the total up to 145 all out.